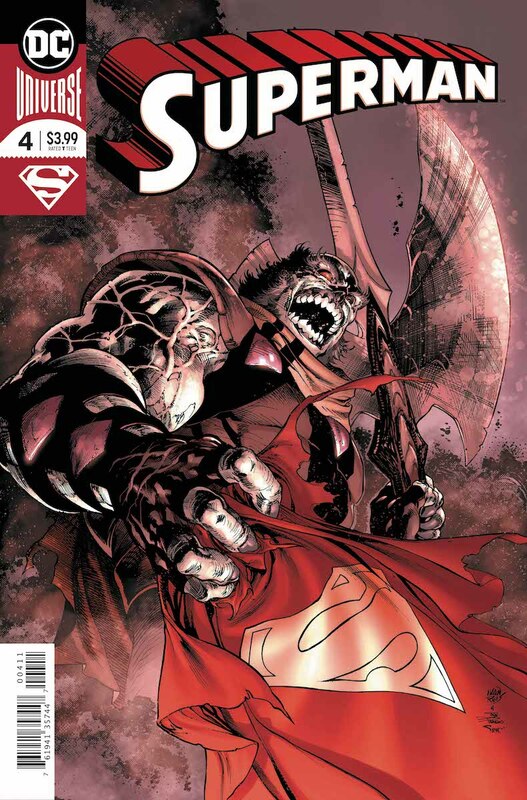 The book opens with Superman just brawling with the combined might of Rogol Zaar and Jax-Ur's mob. 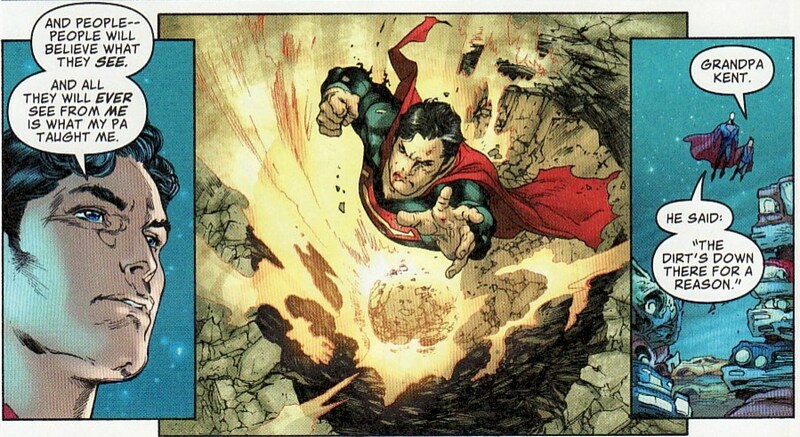 There are big, bold splash pages of Superman throwing himself into the mix. He talks about how fighting Zaar seems foolish. Ma called it 'herding cats'. I love Kent wisdom and we get a ton of it here. 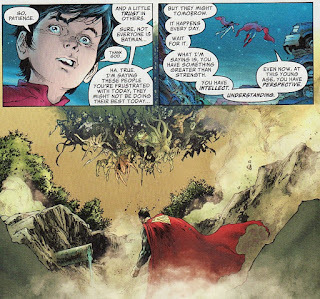 As much as Superman tries to keep the fight in space, Zaar sends it all crashing towards Earth. 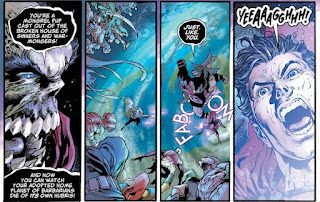 I love the circular 'faboom' around Superman in the third panel, somehow making the force of the blow be more palpable, surrounding our hero. And that last panel! We see how desperate Superman is in the fight. But it is an army he is fighting. Like it or not, Bendis is keeping the solar flare in the armory. Unlike the Johns' stories where the flare completely drained him, it looks like Superman can control it a bit more now. I thought for sure the flare would disappear. With the infantry temporarily disposed, it goes back to Zaar versus Superman. And this doesn't look good. This doesn't look good. Zaar is out to kill. How can Superman respond? In the midst of this fight, Superman flashes back to a conversation he had with Jon. He talks about how easy it would be to unload on people. How easy it would be to kill Batman ... for instance. But holding back is the hard part. That's my Superman. I love that Superman says, almost too casually, how easily he would simply decapitate Batman. Yes they are friends but they can differ significantly in approach. Jon, working with Damien, can probably understand all too well. Superman keeps hoping for the best in people. Someone might madden you one day and impress you the next. People will do good. You have to have faith in people. You need perspective. I love the breakdown of this page. Superman is talking about historical perspective in having faith in people. 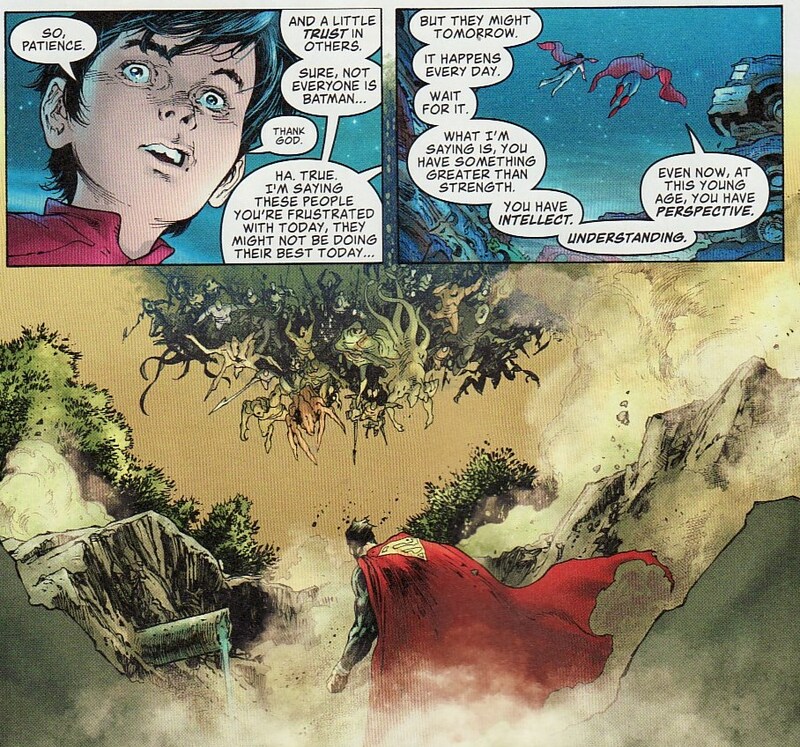 But right after that word ... perspective ... you get to see things, literally, from Superman's perspective. We see a mob flying in to kill him. How hard it must be to keep one perspective when faced with this real one. That is the power of comics, words and images meshing so wonderfully. And without hesitation, he flies into the fray. God I love Pa Kent Wisdom! We then see that sentiment played out in real life. 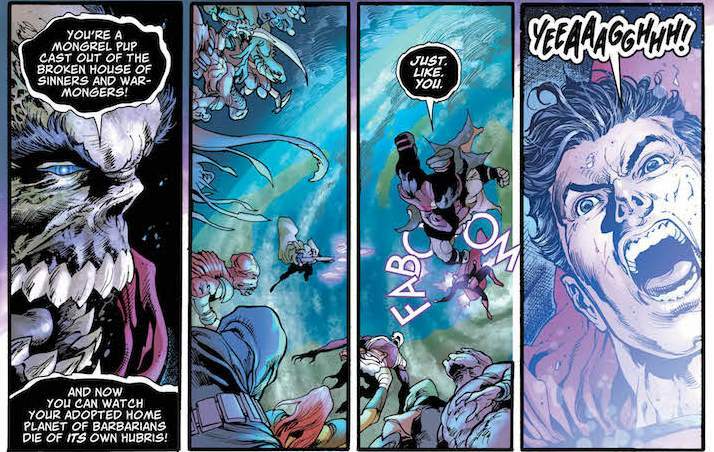 Last issue I wondered why Jax-Ur would help Zaar who may (or may not) have committed Kryptonian genocide. This issue, Superman calls him out on it. Why? 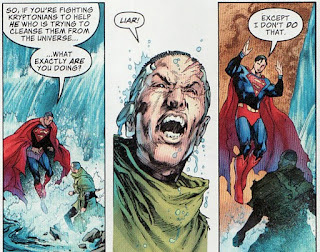 And when Jax-Ur wonders if Superman is lying, Superman says he doesn't lie. People believe what they see. 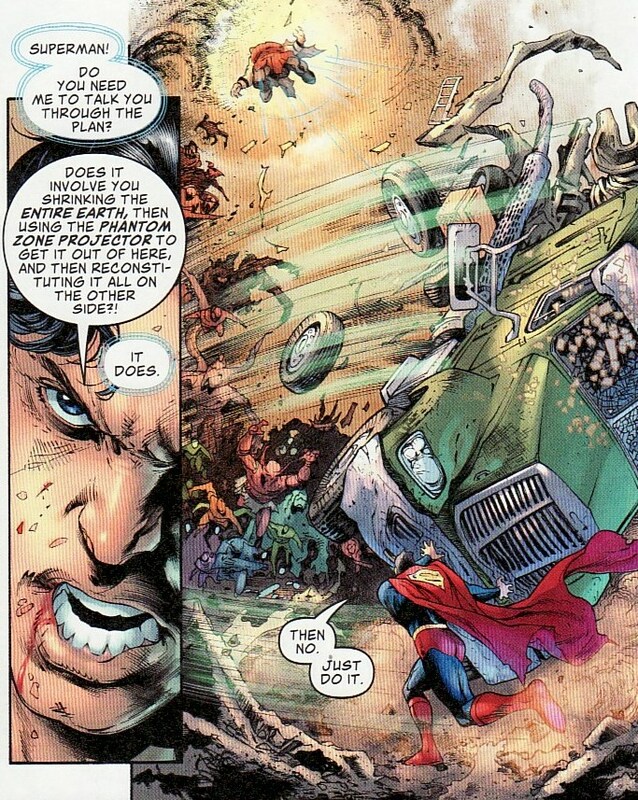 Superman isn't down in the dirt. He rises above, here literally flying away. 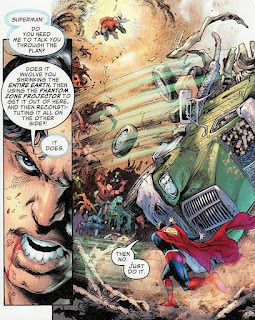 The battle rages on with Superman keeping Zaar at arm's length, even using a tractor trailer as a baseball bat. What a great panel! Luckily, the Atom has found a solution. He'll shrink the Earth until it is small enough to use the portable Phantom Zone Projector to bring it all back. Hmmm ... maybe too easy? Despite a last page that questions if the Earth has returned, it seems like it worked. Everything is back in the proper dimension. 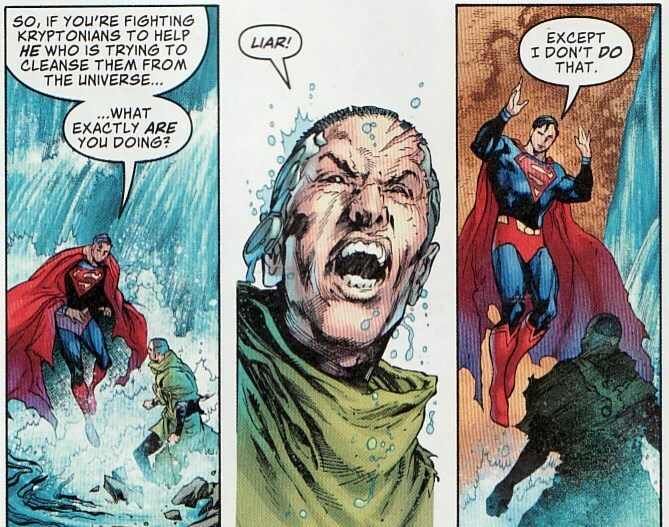 Everything that is except Superman who was too busy clearing the criminals off the surface to take part in the escape. 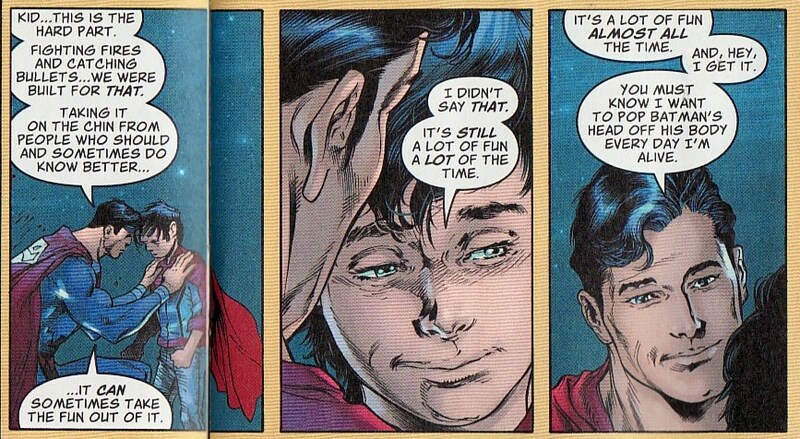 Once more Bendis shows us that he understands Superman. Even though being trapped here, with Zaar, might be a death sentence. But that doesn't matter. Earth is safe. That's all that matters. That was a white knuckle ride of a brawl issue with spliced in scenes of emotion and ethics. And it all clicked. In particular, that 'perspective' panel progression is pure brilliance. And seeing a young, unscarred, less jaded Jon was a treat. It even made the quick solution to bring Earth back a bit easier to swallow. Nothing like a great Superman issue to make me smile.